On March 1st, 2017 a group of investors, founders, lawyers and active members of Vancouver’s startup community gathered to discuss the need for widely accessible, Canada-specific term sheets that will better align founders and funders in meeting their goals. The speaker session and panel discussion, hosted by VANTEC Angel Network and E-Fund and entitled ‘The Quest for Better Term Sheets to Get Deals Done Faster’, highlighted the pain points of both founders and investors when navigating term sheets. Panelists and speakers agreed that existing American-centric term sheet templates such as SAFE Docs are often not suitable for the Canadian market. Debt versus equity: which is right for you? Startups have traditionally funded their operations through the sale of equity, typically issued via common shares or preferred shares. “Common shares are the simplest form of a direct equity investment. Because you’re getting in at the same share class as the entrepreneur, it aligns the investor and entrepreneur. The downside is that it lacks proper investor protection, and it locks in a valuation too early,” Pieter Dorsman, Director and CEO of E-fund explained to the audience. 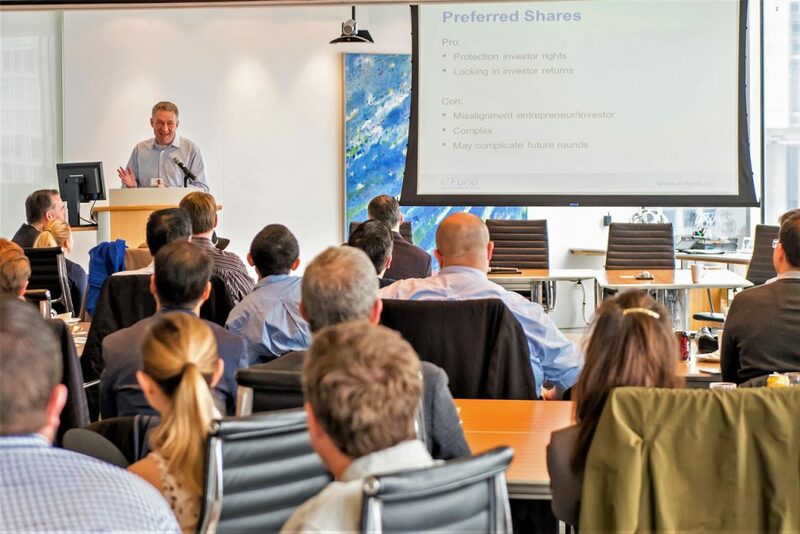 “Preferred shares is the dream for investors. It protects investor rights, it locks in certain returns, but in my opinion it does not always create a perfect alignment with entrepreneurs,” he added. The problem with selling equity at an early stage is that it’s difficult for founders and investors to agree on the value of a company when it still has very few indicators of true value (customers, sales, and revenue). This creates friction between founders and investors and often causes the deal to fall through. This is why convertible debt was introduced. In layman’s terms, money is invested today, and the valuation happens later. While convertible debt solves the issue of having to value a company at the time of initial investment, it is still debt that has to be repaid at a later date – with interest, which is not ideal for founders. Furthermore because a convertible note is debt, companies are legally obligated to repay it later. This is an additional pressure for an early-stage startup, because principal and interest repayments will have to be made later despite profits or economic circumstances at that time. This has led to the creation of convertible instruments that aren’t debt but have many similarities, such as SAFE Docs. What are SAFE (Simple Agreement for Future Equity) Docs? Introduced by Y-Combinator in 2009, a SAFE is a contract in which an investor gives money to a company in exchange for equity at a later date. SAFEs are not debt, because there is no interest and no maturity date, and the company is under no legal obligation to repay the investors. SAFE Docs are available online and free for anyone to use. There are several versions, and they are meant to decrease the legal fees and reduce negotiation times. Dorsman said that American-centric SAFE Docs may also be out of place in certain markets, such as Canada. “SAFEs work best in a frothy market. They were released by Y Combinator in the Valley, at a time when there was such a volume of startups and such a demand for investment that it was very easy for companies to get away with the SAFE. It is very regionally dependent. It’s very driven by circumstances, and for investors I think it’s too much of an open-ended deal. As an investor, if a company comes to you with a SAFE I would encourage you to look at it very critically before you jump in,” he warned. “We are trying to incorporate both the investor’s and the entrepreneur’s point of view… so if you’re a newbie investor or entrepreneur you can go through these to get a feel for what’s going on and how to build the best term sheet for your company,” he added. Visit VANTEC, E-Fund and NACO at the BCTECH Summit in Vancouver on March 14th and 15th (booth 218), or join the conversation around Canadian-specific term sheets on March 16th at NACO’s panel discussion and Q&A session, “What Term Sheets to use for Different Early Stage Financings” (tickets available here).